A GOOD quality lefty Jazz box at this price is indeed a rare & beautiful thing. And, it's actually in the shop, not on order! Comes with a hardcase. Rare early M.I.J. E series Telecaster Deluxe in fighting condition. These never really appeared in any catalogues of the day, but this is the 2nd one I have seen. Please get in touch for more details & pictures. As new 2013 production from Terada Factory , Japan. Minor shop wear only, Still has plastic on pickguards & all rear control panels. Japanese domestic market olive green case & 24 month in-shop warranty. Near mint Rickenbacker Model 4003 with orig RIC hardcase. Looks virtually unplayed,still has the pickup cover over the bridge pickup. However,being Jetglo TINY TINY marks can be seen here & there if you really look. Ever heard an electric 12 string on a record and just fell in love with the sound? Then, gone out and played every electric 12 you could find and NONE of them had that magic sound? Top of the Line Burny from Made in Japan era. No serial number evident. Factory VH-1 pickups , binding over the edge of the frets. Gotoh tuners & gold hardware. Correct "Gibson" type trussrod cover. 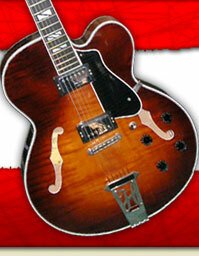 Guild & De Armond ~SOLD~ DeArmond by Guild M75T Bluesbird. Fender Japan Used & Vintage ~SOLD~ Fender Japan C.I.J. "P" series `57 Precsion Bass R.I.
C.I.J. era `57 P Bass in above average condition for age in rare Candy Apple Red. Added gold anodized pickguard, with bridge & pickup covers. Below average weight, great acoustic tone. Zero visible fretwear great playable neck with comfortable action. Please get in touch for more details. Real deal Fender Japan first generation 1989-90 production `57 Strat R.I. Uncredible playability, a guitar at this price simply shouldn't play this well. Fender Japan Used & Vintage ~SOLD~ Fender Japan M.I.J. "T" `75 Black series Jazz Bass R.I.
Dec '72 neck, Jan '73 pickups, '66 pots.. man, add up those numbers and try and calculate the COOL going on here!! It isn't ONLY the Japanese that make great guitars! !